Duct sealing is a very important part of any effort to increase your home's energy efficiency. An air duct system that’s properly cleaned, sealed, and insulated can make your home more comfortable, energy efficient, and safer, and improve your indoor air quality. Complete Home Solutions has the equipment and training to accurately diagnose your ductwork problems and provide safe and effective duct cleaning, duct sealing, and duct insulation services. Contact us today to schedule your free on-site evaluation and estimate! We are your qualified professional for HVAC services in Annapolis, Glen Burnie, Pasadena and surrounding areas. Duct Sealing: We perform air flow and leakage tests, seal air leaks and connections, and repair disconnected ducts to help improve the performance of your ductwork and heating and air conditioning system. 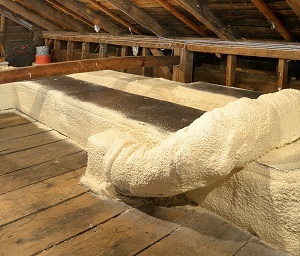 Duct Insulation: Adding insulation to your ducts in unconditioned spaces, like your attic or basement, can help improve your comfort and HVAC energy efficiency. Duct Cleaning: If you have dust, dirt, or pet hair buildup inside your ducts, a thorough cleaning can remove debris and allergens to help improve your indoor air quality and HVAC system efficiency and reduce allergy and asthma symptoms. Before performing work on ducts, we inspect the whole duct system, including the attic, basement and crawl space, and evaluate supply and return air balance. After making duct improvements, we test for leakage and air flow and perform a combustion safety test. Heating and cooling ducts in an unconditioned attic can cause uneven temperatures inside your living space. Leaky ducts: Oftentimes these temperature issues arise because the hot, or cold, air is not actually reaching its intended destination. Duct leakage is letting the air escape before it has arrived in the correct room. This tends to force your HVAC system to stay on longer and longer in order to get the effected rooms to the right temperature. 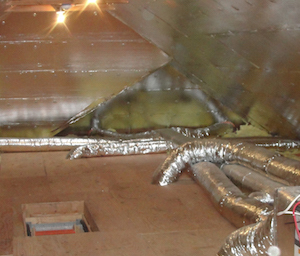 Under-insulated ducts: A lack of proper insulation often causes the ducts themselves to be too hot or cool. Thus the HVAC system actually has to waste time heating or cooling the ducts before rooms can receive the correct temperature air. This leads to a higher heating/cooling bill and may even leave certain rooms still improperly heated/cooled. Ducts with unbalanced air flow: Sometimes the register location can also cause problems. Certain rooms might end up receiving too much air flow from your HVAC system while others might end up largely ignored. Do you have an uncomfortable home during the winter or summer, rooms that don't heat or cool evenly, or high energy costs? Complete Home Solutions can help. We're experts in HVAC system repairs, so we are able to identify ductwork problems and provide the most cost-effective solutions. Whether you need ducts sealed, insulated, or simply cleaned you can rely on Complete Home Solutions to get the job done quickly and efficiently. Contact us today to schedule your on-site ductwork evaluation and free repair estimate!